Multi-award winning Tomintoul Speyside Glenlivet Single Malt Scotch Whisky Aged 16 Years has been lovingly crafted, from a selection of the finest bourbon casks, each aged for at least sixteen years. Comments: "Fruity concoction of apples and pears topped with vanilla ice cream… one of the noses of the year. Soft, indeed every bit as gentle as the label promises, as the light oils coat the palate with a fabulously intense and delicately sweetened barley skin. 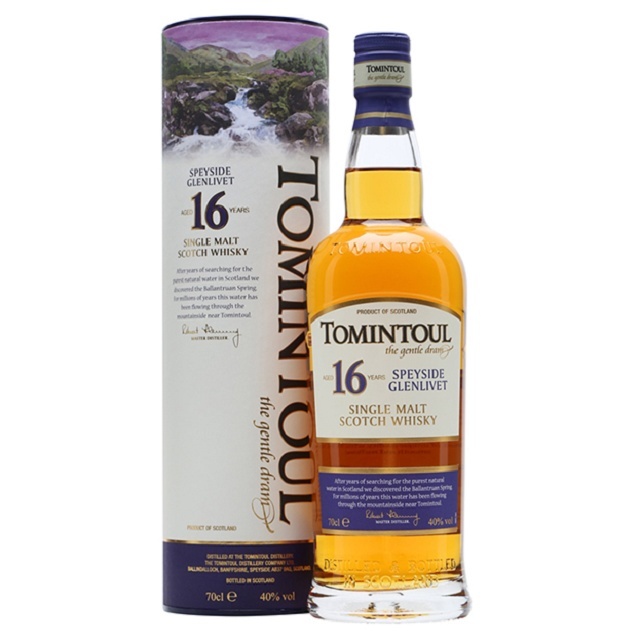 A wonderful, multi-layered interplay between malt and oak-vanillas… hugely sophisticated." Bowmore Darkest 15 Year Old Single Malt Scotch Whisky has been matured in ex-Bourbon casks and then three years in Oloroso Sherry casks, making this Single Malt truly magical. Breathe in delicious dark chocolate, sun-dried fruits and a tell-tale wisp of Islay smoke. On the palate sip wonderful cedar wood and a rich treacle toffee and savour the robust and complex finish with a hint of Sherry tannin. Appearance: Golden honey. Nose: At full strength, heady, nose prickle, pear drops and tightly integrated heather, resin and sweet honey-nut notes. Enticing. Intriguing. With a little water, still harmonious but less pronounced, allowing some malt-cereal, soft, spicy wood, moorland and faint traces of wood-smoke to appear. Body: Soft, pleasing, medium. Palate: Palate Well balanced, smooth mouthfeel; short punch, sweet and fresh, then a pronounced drying effect. Enjoyable at any time, with little or no water. Finish: Quite short. Some lingering sweet smoke in the attractive, drying aftertaste. Massive, peat-smoke typical of southern Islay, yet with a dry finesse that makes up a classy package. Apparently the teetotal Johnny Depp sometimes orders a dram of this and just sniffs it (it's that good). A worthy classic. Tasting Notes: Nose: Lapsang Souchong and fruity sherry. Palate: The dryness is at first offset by the sweetness of the sherry character. As the palate develops, oily, grassy, and, in particular, salty notes emerge in a long, sustained, aggressive, attack. Finish: A huge, powerful, bear-hug of peat. Comment: The driest of Islay malts, and an established classic. Christmas cake, honey, and rich fruit - with a long cinnamon finish. Matured exclusively in hand-selected sherry casks for 21 years. Perfect after dinner or, frankly, anytime. This bold expression with a deep gold colour has notes of fine toasted cereals, roasted hazelnuts and exotic fruits, making it a rich, fruity malt with a refined and long-lingering finish. The "Classic Malt" from the Highlands, from Scotland's highest distillery (326m). With a balanced sherry character and silky honey note. Tasting Notes: Appearance: Gold. Nose: A big, crisp, dry and very aromatic nose with hints of heather and peat. Body: Light to medium. Palate: Smooth, soft and lasting flavours of heather, honey sweetness and vanilla followed by deeper citrus-fruit flavours and hints of malted bread. Finish: Long, lingering, surprisingly intense finish that starts sweetly, then gives way to smoke, peat and malt.